If you want the low maintenance features of vinyl siding for your home, but can't get excited about an ordinary looking vinyl exterior, then you should consider some of the more realistic-looking vinyl siding styles that are now available. In fact many vinyl siding manufacturers that once produced only horizontal clapboards with a smooth finish now offer dozens of siding styles with such realistic looking textured finishes that you can get excited about shopping for vinyl siding. Vinyl cedar shakes have such realistic grain patterns and textures that you almost have to touch them to determine if they are real wood. Available with deep grooves and staggered edges, which mimic the look of hand-split cedar shakes, this style of siding is perfect for mountain get-aways, coastal homes, and other structures which require a rustic aesthetic. At a cost of between $450-$750 per square (the equivalent of 100 square feet of wall coverage), they are typically one of the more expensive styles of vinyl siding, but they are more durable than real wood shakes and don't require any costly seasonal maintenance. Vertical board and batten vinyl siding is available with either a wood grain finish or a rough-sawn texture, making a realistic looking panel that mimics the look and feel or traditional vertical wood siding. The board and batten pattern alternates wide and narrow panels, with the narrow panel (the batten) raised about a 1/2 inch above the wide panel (the board), which creates a distinct and appealing shadow line. 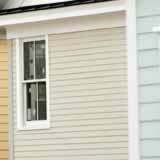 The cost of this style of vinyl siding is between $150 and $220 a square, depending on the manufacturer. Vinyl log siding is made to look like log cabin siding, and the half-round pattern of each panel has a textured finish which mimics real cedar logs. You can expect to pay about $450 per square for vinyl log siding. While these are some of the most realistic looking vinyl siding styles, there are many others available that may suit your needs as well. If you want a realistic looking vinyl siding, then choose those that have textured finishes or real wood-grain patterns, and avoid the ordinary looking panels that offer only smooth surfaces.